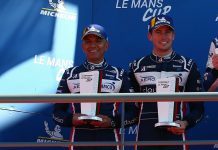 The first race of the Road to Le Mans weekend has been won by the no2 United Autosports Ligier of John Falb and Sean Rayhall. 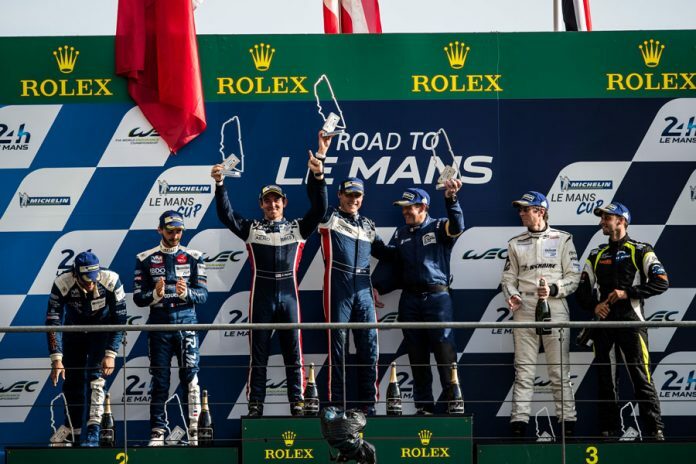 With high temperatures and bright sunshine the scene was set for an epic first battle on the full 13.6km circuit at La Sarthe. 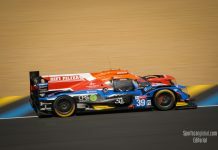 The all American team started 4th on the grid and fought their way to the front after the pitstops with Rayhall bringing the car home five seconds ahead of the no18 M.Racing-YMR Ligier-Nissan of Alexandre Cougnaud and Romano Ricci. The GT3 category was won by the #97 TF Sport Aston Martin V12 Vantage GT3 of Tom Jackson and Ahmad Al Harthy. Starting from 10th on the GT3 grid the Anglo-Omani duo fought their way up to second place behind the #95 Spirit of Race Ferrari but with less than five minutes remaining Maurizio Mediani was handed a 8 seconds stop and go penalty for not respecting the pitstop time, handing the win to the #97 Aston Martin. #3 DKR Engineering Norma with Alexander Toril led from the start. Peter Kox in the #48 Kox Racing Ligier briefly led before Toril regained the lead before the end of lap 1. #8 SVC Sport Management Lamborghini of Steeve Hiesse led the GT3 category ahead of the #76 IMSA Performance Porsche 911 of Raymond Narac. On Lap 2 Zone 9 was subject to a slow procedure to recover the #44 SPV MotorSport Ligier of Andrew Cummings. Slippery track flag shown at Indianapolis because of gravel on track. Lap 5 Narac overtakes Hiesse to take lead of GT3. #91 DKR Engineering Adess-Nissan of Yojiro Terada clipped the barrier at zone 31 and slow zone declared to recover the car. 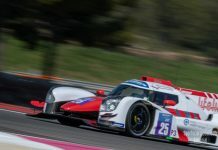 After pitstops are concluded the order is shaken up with the #2 United Autosports Ligier of Sean Rayhall leading from the no14 RLR M Sport Ligier of Martin Rich. Maurizio Mediani leads GT3 with the #76 Imsa Performance Porsche of Thierry Cornac in second but Cornac is quickly caught and passed by the #97 TF Sport Aston Martin of Ahmad Al Harthy for second place. Rayhall holding lead but being caught by the #18 M.Racing YMR Ligier of Romano Ricci but Rayhall responds and opens up the gap to 5 seconds at the chequered flag. The #14 RLR MSport Ligier of Alex Kapadia and Martin Rich takes the final podium place. The #95 Spirit of Race Ferrari of Mediani takes the chequered flag but is given a time penalty for not respecting the pitstop time and this drops the Ferrari back to 3rd place. Following an investigation the #7 Mercedes of Lee Mowle was given a penalty for a pit stop infringement and went down to the 39th position. The #95 ‘Spirit of Race’ Ferrari of Christophe Ulrich and Maurizio Mediani was promoted to second position followed by the #46 Ebimotors Lamborghini Huracan GT3 (Emanuele Busnelli/ Fabio Babini). Words: Jeff Carter – Le Mans Cup. Audio: Nick Holland – Sportscarglobal. Next articleLe Mans: Toyota Takes Pole, New Records All Round (Updated: Audio Added).